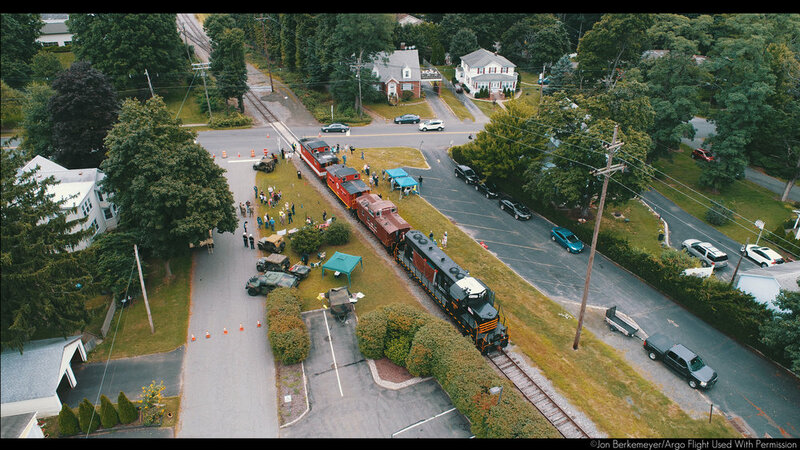 The Military Transport Association partnered with the Dover & Rockaway River Railroad to perform a special dedication ceremony at Succasunna, New Jersey’s 31st annual Olde Suckasunny Day on Saturday, September 8, 2018. A special locomotive was unveiled on the railroad tracks between Main Street and Route 10 at noon. Jointly prepared by the Dover & Rockaway River Railroad’s parent company (Chesapeake & Delaware, LLC) and the non-profit Military Transport Association, locomotive No. 1823 was specially decorated to honor New Jersey’s military veterans. Railroads have long been important in the history of the U.S. military, from the Civil War to present. Moving vast quantities of troops, supplies, and munitions requires an extensive, efficient network of rail to effectively defend our nation. This locomotive pays tribute to the legacy of military transportation and the 371,383 veterans currently living in New Jersey.